At the beginning of April, Jarred walked us through the refresh of the bottom two-thirds of NVIDIA's 700M series of GeForce GPUs, all under the GeForce GT heading. We still didn't have any idea what their solutions at the top end would be, though. Today we have those details with the launch of the GTX 700M series. Note that the 680MX (not listed) exceeded the 100W TDP and was never made available in notebooks; it was an iMac exclusive GPU. Spec-wise it was identical to the 780M, but had a slightly lower core clock at 720MHz. 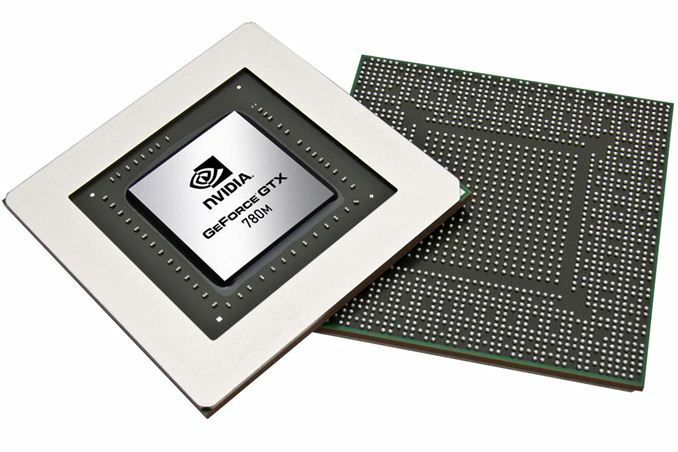 That means that in the 700M series, NVIDIA has a fully-enabled GK104 chip at the top of the pack and I can confirm you'll be seeing it in notebooks since I have one of those notebooks in for testing as I write this. NVIDIA has made some incredibly impressive gains in potential performance with the GTX 700M series. Core clocks are up across the board, memory clocks even more so, and NVIDIA is bringing GPU Boost 2.0 to the table with all of these parts to allow as much as 15% higher clocks during gaming. Unfortunately I don't quite have all the benchmark results available yet for the new 780M to compare against the outgoing 680M, but you'll be able to see them in a full review in not too long. As far as specs go, the big jumps are easily visible in the above table. At the top, GTX 780M gets 14% more shaders than GTX 680M, courtesy of the full GK104 chip, but it also gets a base clock that's at least 14% higher, giving a theoretical performance increase of 30%. The memory clock receives a similar increase, this time to the tune of 39%, so we should definitely see a large jump in performance at the top of the product stack. Stepping down to the GTX 770M, the changes are a bit more difficult to guage. We have the same number of cores as the GTX 675MX at a higher clock, giving 35% more compute power, but memory bandwidth has dropped 17% thanks to the 192-bit bus. In situations where games are compute constrained, we'll see much improved performance, but bandwidth hungry games may end up slower. We see a similar situation with the GTX 765M vs. the GTX 670MX, with a 128-bit bus on the new model and fewer cores at higher clocks. On paper, the GTX 765M has 13% more compute and 5% less bandwidth than the 670MX. Rounding things out, at the bottom we finally have an x60M part that's worthy of the GTX designation. The GTX 660M was really just a moderate clock speed increase over the GT 650M. This time, the GTX 760M gets twice as many cores as the GT 750M, and while clock speeds are slightly lower it should still result in compute performance that's 35% higher than the closest non-GTX part; the GTX 760M also has 57% more compute than the previous GTX 660M. The bandwidth story is a bit more difficult to call, with an effective 64GB/s behind the GPU core; the GTX 660M had 4GHz GDDR5 as well, but 750M comes with up to 5GHz GDDR5. Sigh. Can't we get rid of the give and take for a change and have a clear winner? At least there are no DDR3 options listed for the GTX parts, but that's been the case for a few generations now. We can't talk about Haswell yet, so you'll have to wait a bit longer for our first GTX 780M notebook review, but overall we're looking at some relatively sizeable gains over the 600M, with GPU Boost 2.0 potentially increasing the performance even more. Considering Intel's GT3e parts are expected to at least flirt with GT 650M levels of performance (depending on the game and at substantially lower power draws), this sort of performance upgrade isn't particularly surprising. Now we just need to wait for hardware to start shipping. Update: BioShock Infinite is able to produce 41.5 fps at our enthusiast settings with the GTX 780M, which are 1080p and all the settings dialed up. 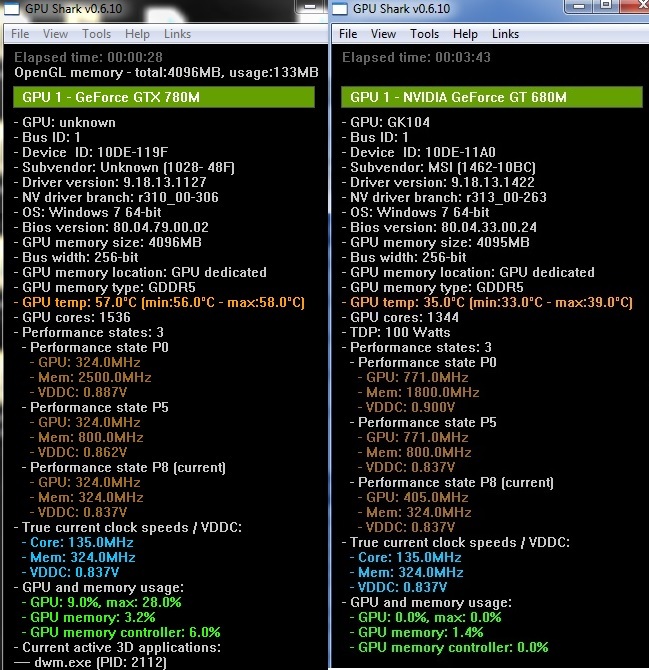 The outgoing GTX 675MX produced only 35.6 fps, while HD 7970M currently gets 45.3 fps. Anandtech should mention the reason why Nvidia manage to be able to keep the GTX 780M TDP to 100W like the GTX 680M despite having more cores and higher clocks, is because the GTX 780M is running on lower voltage than GTX 680M. That is why GTX 680MX have 122W TDP, and GTX 780M does not. those voltages are incorrect. 680m will run up to .987V on a default BIOS. It will also run at .9V at times when there is a light workload on reduced clocks.